“Call Me Maybe” supercut: Carly Rae Jepsen's hit song sung by everyone on the Internet. 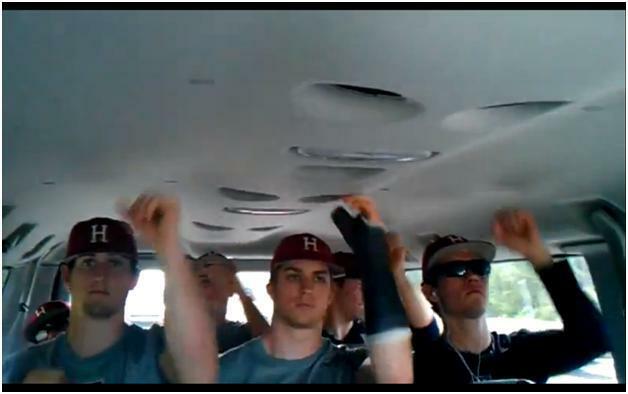 Harvard Baseball’s take on “Call Me Maybe” is just one part of the viral phenomenon. It’s not even Memorial Day, and already we may have the song of the summer. The viral phenomenon of Carly Rae Jepsen’s infatuation anthem “Call Me Maybe” (which just jumped to no. 2 on the Billboard charts) has been noted and dissected elsewhere: A homemade-looking lip-sync video made by Justin Bieber, Selena Gomez, and others turned the song into a sensation, and since then everyone from James Franco to Katy Perry has taken the imaginary mic. In this supercut from Popdust, the song gets covered by what appears to be a good chunk of North America. Popdust did an excellent job compiling and editing together dozens of different tributes on YouTube (each is also linked in the video), and you’re sure to see some you haven’t seen before: Maybe you’ve seen Harvard Baseball deadpan a synchronized dance routine while on a sleepy roadtrip, but have you seen SMU Rowing’s take on their video? The song, it seems, cannot be stopped.